The ancient Greeks and Romans thought fennel could bring strength and fortitude and lead to longer life. It’s is a staple of traditional Indian and Iranian systems of medicine. It’s also very nice to eat! Sweet, aromatic fennel (Foeniculum vulgare) looks like a larger version of its relative, dill, but has a distinct liquorice-like flavour. It’s a popular part of the Mediterranean diet and has long been valued as a healer, particularly when it comes to soothing digestive troubles. Both the seeds and the bulb/leaves are edible and widely used for culinary and medicinal purposes and share many of the same benefits, giving you multiple ways to get the most from this versatile plant. The essential oil is steam-distilled from crushed fennel seeds. It is pale yellow with a sweet-spicy, green smell, reminiscent of aniseed and has anti-inflammatory and antimicrobial properties. It makes a good abdominal massage oil to ease digestive upsets and can also be used diluted in water to make a gargle or mouthwash to treat gum infections. The bulb and tender young stems also contain anti-inflammatory and antioxidant substances including rutin, quercetin, kaempferol glycosides and anethole, which may account for their claimed benefits in supporting healthy digestion and regulating hormones. 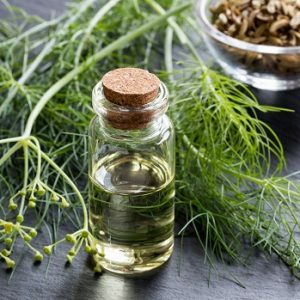 One study which looked at the anti-microbial properties of fennel essential oil found that it was effective against a wide range of bacteria including against Bacillus cereus, Bacillus megaterium, Bacillus pumilus, Bacillus subtilis, Escherichia coli, Klebsiella pneumonia, Micrococcus luteus, Pseudomonas putida, Pseudomonas syringae, and Candida albicans. Researchers found that ground fennel seeds in solution were effective against bacteria that cause indigestion, diarrhoea, and dysentery, as well as some hospital-acquired infections. According to another study, fennel was effective at combating free radicals, which cause disease. This suggested fennel extracts could be used to help individuals ward off the effects of many chronic diseases and dangerous health conditions, including cancer, hardening of the arteries or atherosclerosis, and inflammation. A tea made from crushed fennel seeds contains oils and other active substances that can help relax the smooth muscles of the gastrointestinal system and reduce gas, bloating and stomach cramps. Some of the oils found in fennel have also been found to help stimulate the secretion of digestive juices. This makes it a go-to remedy for everyday indigestion, but tinctures or teas made from fennel seeds can sometimes be helpful for symptoms of irritable bowel syndrome, ulcerative colitis and Crohn’s disease as well. Studies have found that a combination of peppermint, caraway, and fennel is useful in reducing gas and cramping in people with indigestion. This is a good mixture for an after dinner tea. Fennel can also be effective against worms and parasites due to the volatile oil anethole which also gives fennel its characteristic anise flavour. Tiny tummies can also benefit from fennel; its anti-spasmodic action make it a good choice to calm infant colic and fennel is a common ingredient in infant ‘gripe waters’. In one study, supplementing with fennel seed oil relieved colic in 65% of cases, compared with 24% of infants receiving a placebo. The amount used was 1 to 4 teaspoons, up to four times per day, of a water based remedy containing of 0.1% fennel seed oil. If you are concerned about giving you baby fennel and are breastfeeding, then try drinking fennel tea throughout the day as the benefits will be passed on via your breastmilk. A syrup made from fennel juice is traditionally used to thin mucous and help make coughs more productive. In part this may be due to its antibacterial properties. But fennel is also an anti-inflammatory and there is evidence that it can be effective against a variety of inflammatory diseases and type IV allergic reactions (a delayed type of hypersensitivity, since the reaction takes 2-3 days to develop). It also has a general analgesic effect that can benefit sore throats. In traditional Europe and Mediterranean medicine, as well as in folk tradition in America, fennel is regarded as an effective diuretic, helping to relieve water retention and bloating. There are no human studies to back this up, but animal studies suggest it is effective. In mice, for example, fennel tincture was shown to reduce excess water without any significant changes in potassium or sodium levels – always a worry with diuretic use. In other evidence with rats, it has been shown that while fennel does have a diuretic effect it does not have a concomitant effect of lowering blood pressure – suggesting that its diuretic effect is working through different physiological channels than conventional diuretics. Studies show that fennel is a source of plant estrogens or phytoestrogens and therefore can mimic the effects of estrogen. This quality may be why it is used to balance hormones in women of all ages – from young mothers to women in menopause. Painful periods or dysmenorrhoea are a common problem for many women, who often use over-the-counter medications, such as non-steroidal anti-inflammatory drugs (NSAIDs) to treat the pain. But around 10-20% of women who suffer from severe cramping and discomfort during their period don’t find relief through conventional pain killers. Many turn to alternative or complementary treatments instead, and one study from 2012 found that fennel can be helpful in this regard. It found that fennel has properties that can help reduce uterine contractions, the source of painful dysmenorrhea, while its gentle diuretic effect can help reduce uncomfortable bloating. For older women there is evidence that can be effective in the management of postmenopausal symptoms such as hot flashes, sleeplessness, vaginal dryness and anxiety, without serious side effects. In this study soft capsules containing 100 mg of fennel were administered twice daily for eight weeks. The fennel proved to be a safe and effective treatment to reduce menopause symptoms without serious side effects. The researchers concluded that fennel could help ease menopausal symptoms in women with low estrogen levels as well as those who have experienced early menopause or have had a hysterectomy or oophorectomy. Another symptom of menopause can be increased facial hair growth. In one double blind study, while a cream containing 2% fennel extract did not stop hair growth, it did produce significantly finer hairs. This effect, the authors suggest, is related to fennel’s estrogenic effects. Getting more fennel in your diet is a great way to enjoy the benefits of this plant. The bulb and tender leaves can be added to soups, braised or roasted in oil. It can also be sliced thinly and eaten raw in salads. Fennel is a low-calorie source of vitamin C, dietary fibre, potassium and calcium as well as a range of antioxidants and anti-inflammatory volatile oils. It’s also surprisingly rich in beneficial fatty acids. The oil-rich seeds can also be used to flavour fish, meat and vegetable dishes, as well as breads and chutneys. As a tincture, 1–2 teaspoons (5–10 ml) can be taken three times per day in a little water, and between meals. Fennel is also available in capsule form; take as directed, and as with all powerful herbs, don’t be tempted to exceed the maximum dose. If you are using the seeds medicinally aim for 5–7 g (1 to 1.5 tsp) per day. To make a decoction, boil 2-3 g (1/2 teaspoon) of crushed seeds per cup (250 ml) of water for ten to fifteen minutes, keeping the pot covered during the process. Cool, strain, and then drink three cups (750 ml) per day.